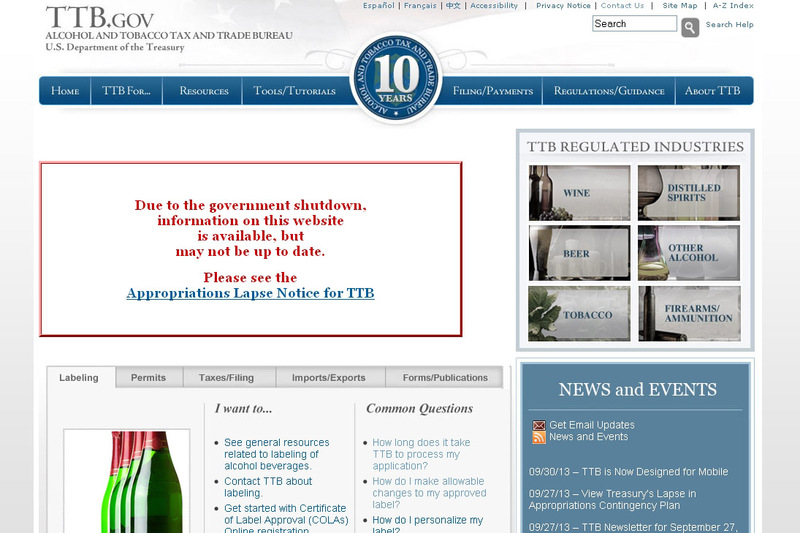 Day 1, 10/1/2013, 6:30 am ET: TTB is shut down for the most part but at least COLAs Online and Formulas Online seem to be functioning normally (to retrieve approvals, etc.). Permits Online and COLA Registry seem to be working normally too. Day 1, 8:55 am ET: this notice posted to the front of ttb.gov. No updated notice on the voicemail system. Day 1, 9:10 am ET: this notice paints a pretty dire picture. 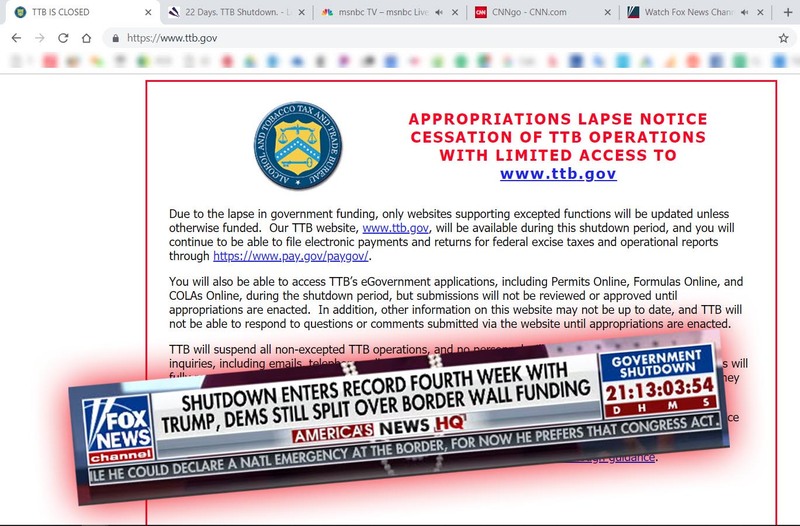 It says: “there will be no access to TTB’s eGovernment applications including, but not limited to, Permits Online, Formulas Online, and COLAs online.” It further says: “TTB has directed employees NOT to report to work and they are prohibited by federal law from volunteering their services during a lapse in appropriations.” If it’s really true, that the websites (such as CO, PONL and FONL) will be shut down, I am happy that we went to the bother over many years to get a copy of every one of tens of thousands of approvals we have handled. It was a lot of work but we knew it was just a matter of time before one calamity or another came to pass. Day 1, 9:15 am ET: I am happy to report that, despite the 9:10 message above, the websites seems to be operating normally. If you can see this COLA, they still are. 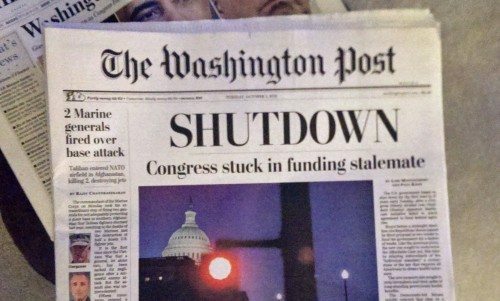 If I may editorialize just a bit (more) — how very banana republic when the government is shut and we know not when it may resume, but have to wait for it anyway to do just about anything. Day 1, 9:30 am ET: sites now off, as here. This is going to get ugly (uglier). Day 2, 10/2/2013, 8:30 am ET: this is nuts. 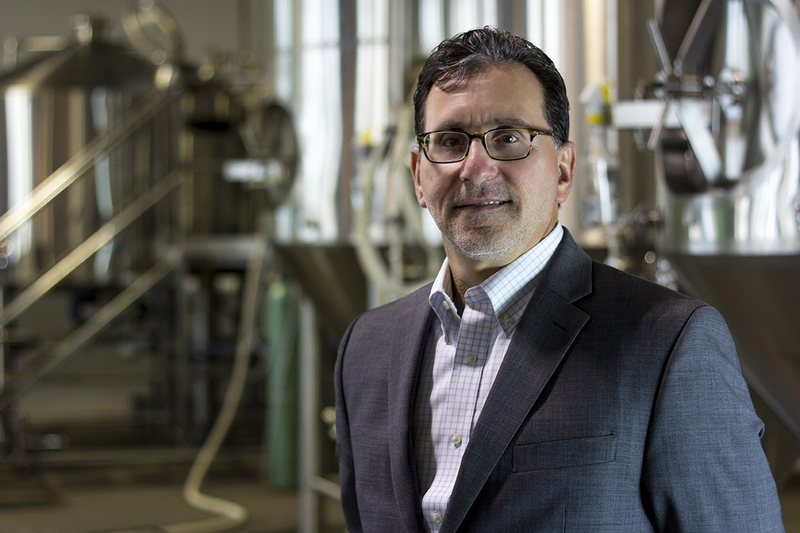 It is close to impossible for many alcohol beverage companies to get oxygen or sunlight. 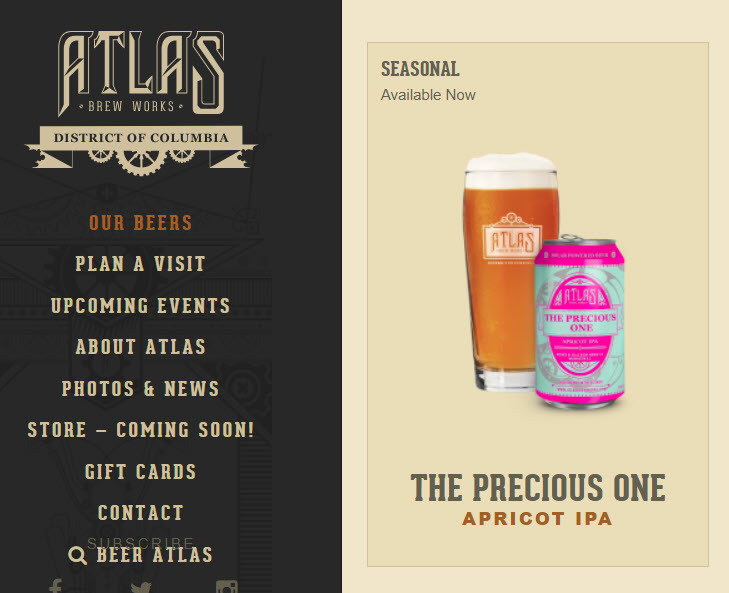 As I peruse the list of things most adversely affected, such as national parks, it is tough to find areas more adversely affected than beer, wine and spirits. (For example, whereas the adverse impact on a new flavored wine at 8% is almost total, the impact on the same product at 6% would be nil.) It is particularly egregious to set up a system where most every move must be slowly and painstakingly reviewed and approved — then withhold such review and approval, indefinitely. In the case of parks, the eager vacationer can always divert to Disney, the beach, or a local bar. Many beverage companies have no such options, but to wilt. Want to add some coriander to that beer? No can do. Until someday in the far-off future, after the parties decide to talk, the government perhaps reopens, the backlog clears, and eventually, at best, it goes back to something resembling the pitifully slow system of the past where it can take well more than six months to jump through enough hoops to add that coriander to that beer. Need to take something out of that flavored vodka? You can’t do that either. So long as there is a realistic possibility that things like the above can happen, the rules ought to provide backup systems. Without faulting any particular agency or party, I fault a system where the regulated parties are held to high standards and the government is held to approximately no standards at all. Day 3, 10/3/2013, 7 am ET: how long until the very best people at TTB start to bail out, and the prophecies of the most ardent government detractors get fulfilled? Day 6, 10/6/2013: things will be jammed up for months, at best. Day 17, 10/17/2013: TTB finally comes back to life. Google has more than 26,000 items about the shutdown’s impact on beer alone. 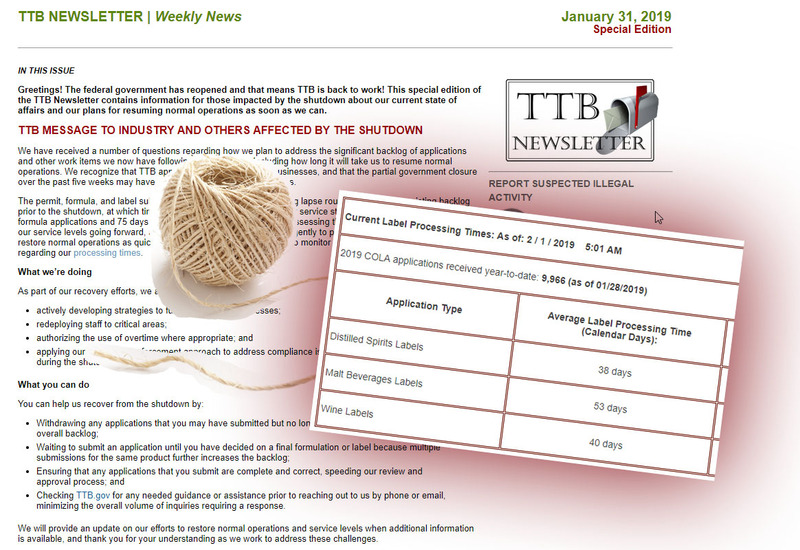 Will TTB shut down this week and if so how painful will it be? And who will get the blame? 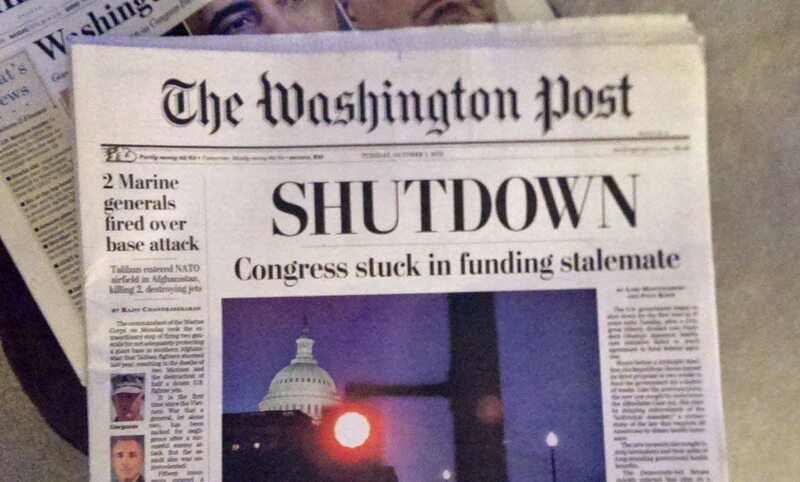 As of this writing (2 pm ET on the last day of September) a shutdown looks all but certain. The New York Times says the only big question is who will get the blame. I don’t see much on TTB’s website about this yet, but Google helpfully (as always?) turns up this Shutdown Plan. Many things were jammed up before this big piece of other than good news so it’s going to be brutal and slow for quite some time. If you did not start seeking approvals long ago, it sure looks like you will be regretting it any moment. It’s ironic, or is it absurd or even obscene, that a group of well to do people, with top notch healthcare for themselves and their families, paid for by taxpayers, would be in a position to deny affordable health care to others. Shut it down. I’ll save 25 minutes on my drive to work every day.